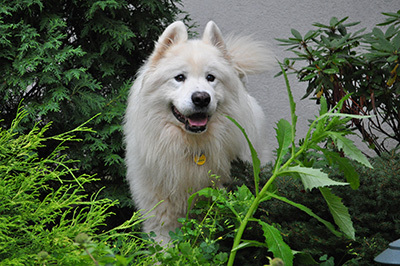 Diabetes mellitus is a common condition in people and relatively common in dogs, as well. It is a chronic condition in which the body either isn’t making enough insulin or isn’t responding to the insulin being produced. Insulin, a hormone secreted by the pancreas, helps regulate blood sugar (glucose). Glucose is a by-product of the food our dogs eat; it provides energy to the cells in their bodies. There are two common types of diabetes mellitus. The first type occurs when your dog’s body can’t produce enough insulin; this is called type 1 diabetes. The second type of diabetes occurs when the body doesn’t respond to insulin; this is called type 2 diabetes. Dogs almost exclusively have type 1 diabetes. Occasionally, diabetes can be secondary to underlying disease, such as severe pancreatitis. Diabetes usually affects middle-aged to older dogs, and those who are overweight are also at higher risk. While both male and female dogs can become diabetic, it is much more common in females. Some breeds are at a higher risk as well. Your veterinarian will perform a thorough physical exam and take a detailed history of your pet’s health. The symptoms of diabetes mellitus are very similar to other diseases, such as Cushing’s syndrome, liver or kidney disease, Addison’s disease, and hypothyroidism. Sometimes, underlying diseases or conditions can cause interim diabetes, and once the primary disease or condition is treated, the diabetes resolves. The treatment of diabetes mellitus almost always involves once- or twice-daily injections of insulin to help regulate your dog’s blood glucose level. Here are two videos, caring for your diabetic dog and giving injections to your pet, which may be useful to you.